There are not enough cupcakes in my life, and I want to remedy that. Recently, I was in a cupcake-y mood, and I decided to make one of my very favorite flavor combos, lemon and raspberry. After poring through all of my cookbooks and a few websites, I decided to mix and match recipes for cake and frosting, knowing that my filling would be raspberry jam. I chose a lemon cupcake recipe from Baking Bites, and lemon cream cheese frosting from the Better Homes & Gardens Cookbook. I made 12 large and 24 mini cuppies. At first, I felt disappointed with how these turned out. The cake was dry (I overbaked), the frosting was far too sweet for my tastes, and my pastry bag/tip/coupler and I got in a fight about the jam. I also like a much stronger, brighter lemon flavor than I felt came through in the final product. However, I'm learning that I'm becoming a severely harsh critic when it comes to my own baked goods. When I brought them to Andy's office, his coworkers devoured them in seconds, and were kind enough to shower me with compliments. After I tasted another mini one (or maybe two! ), I decided that they weren't so bad. I'm definitely going to keep experimenting with this flavor combo. Stay tuned for Take 2 sometime soon. 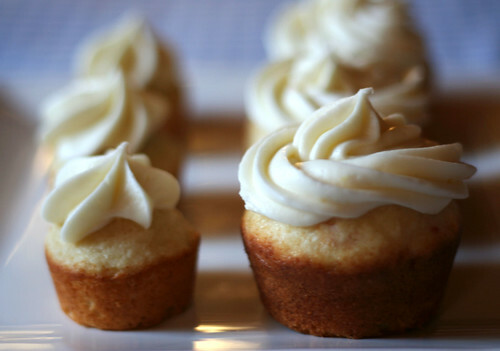 There are many more lemon cake recipes out there than ones specifically for cupcakes, so I might try using a full cake recipe baked in cupcake form. In the meantime, as long as you don't overbake the cake and enjoy extra-sweet frosting, I think you'll enjoy these recipes. 1. Preheat oven to 350F. Grease 24 muffin cups with non-stick baking spray or line with paper liners. 3. In a large bowl, cream together butter, sugar and lemon zest until light and fluffy. Mix in eggs one at a time, followed by vanilla extract. Stir in 1/3 of the flour mixture, followed by half of the milk. Add another 1/3 of the flour and the remaining milk, then stir in the remaining flour, mixing only until no streaks of flour remain. 4. Divide batter evenly into prepared muffin cups, filling each approx 2/3 to 3/4 full. 5. Bake for 16-19 minutes, until a toothpick inserted into the center comes out clean and the top springs back when lightly pressed. Cool completely on a wire rack. 6. If desired, use a pastry bag and tip to fill the cupcakes with seedless raspberry preserves or lemon curd. 1. In a mixing bowl, beat cream cheese, butter, and lemon juice on low to medium speed with an electric mixer until light and fluffy. 2. Gradually add 2 cups of the powdered sugar, beating well. 3. Gradually beat in remaining powdered sugar until frosting reaches spreading consistency. Stir in the lemon peel. UGH! Why didn't you make these last week!? Well they sound great to me! I can taste them already - yum! First of all, the picture of the little cupcakes next to the big cupcakes is just adorable! I think it's so great when you can deviate from recipes and play around with your favorite flavors... I wish I was more adventurous like that sometimes. It sounds like this was a winning recipe, but you still want to make it better... and I'm sure you will! These sound thoroughly delicious and a great break from Thanksgiving food. I'm a lemon lover, so I'll follow you anywhere. When I make lemon cake - I use 2 tables fresh lemon juice and have found by adding 1/2 cup of sour cream to nearly any cake batter it is a moist cake result. I think those cupcakes look incredible! And I love how you piped them! I am terrible at piping. What kind of tip did u use? 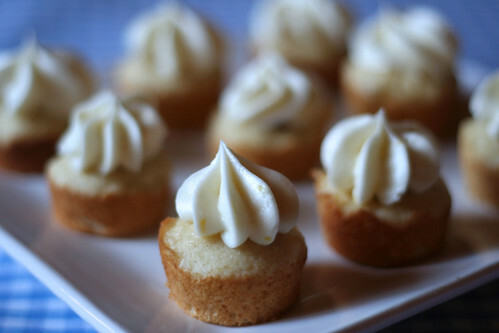 I am going to put lemon cream cheese frosting on EVERYTHING. Yum yum yum. oooh, you should have a piping tutorial, I am totally inept at that. They look great! Lemon and raspberry together is one of my favorite flavor combinations as well so maybe I'm biased about how great these sound!